Clean-cut character: Eric Rasmussen always kept his hair clean and short. He shaved twice a day and brushed his teeth after every meal. He wore sharp suits and kept his shoes polished. He never tried drugs or alcohol and spent much of his free time volunteering and helping kids. He never let his hair get scraggly during monthlong drug binges. He never grew a stringy, food-filled mustache that, paired with his chew-stained teeth, matched the color scheme of his baseball uniform. 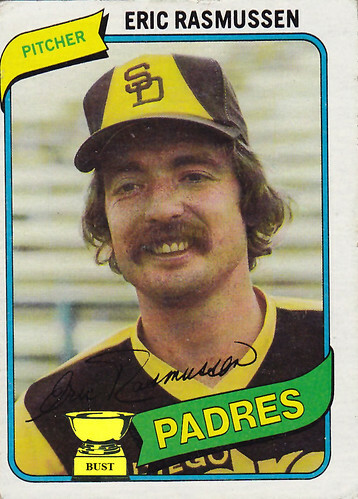 He never looked like he spent the hours before and after baseball games dropping acid and drinking whiskey. Wait, what? Oh, that Eric Rasmussen. We thought you meant Eric Rasmussen, chairman of the Early Childhood Music Department at the Peabody Institute at Johns Hopkins University. Apologies.